“The best bits: It gave a focus for class topics, e.g. Where’s Wally? ; The Big Read and author visits. 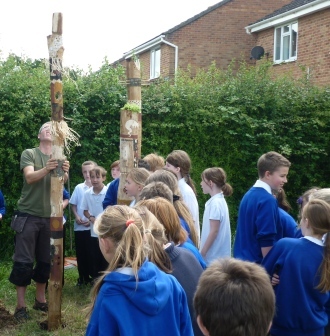 In June, Chris Holland returned to Holbrook to help us with our Year 6 project. He came in to have a talk to us and tell us about what we would be doing for our project. We all took turns to complete our piece of artwork. We used drills and chisels to make our own section unique. We could then use paint in the colours of red, ochre and black to make it stand out more. 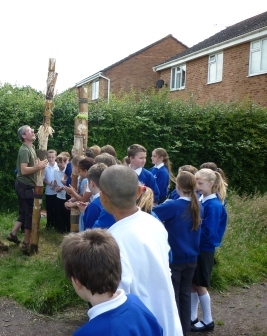 After all the brilliant designs, including one of the Holbrook dragon, we held a special ceremony for our poles to be put up. 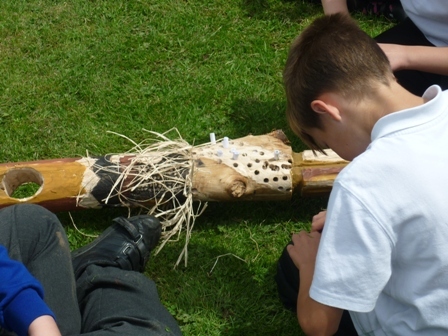 Each year 6 then wrote a wish and a gratitude to be put inside the wood. 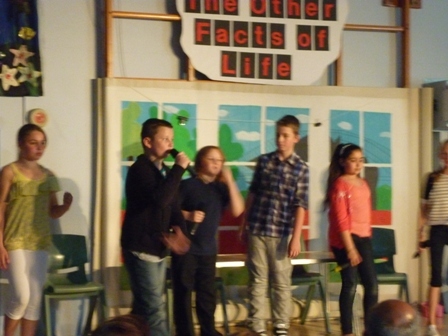 Yesterday was the third and final performance of our Y6 play called ‘The Other Facts of Life’. It was based on the Morris Glietzman novel of the same name. The script was written by Mrs Nunn. Adam played the part of Ron, the father of Ben. 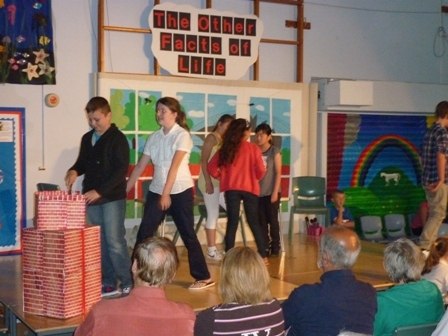 The play was about Ron’s younger son, Ben, who starts to worry about world issues such as the starving millions and the treatment of animals. Ron does not really understand his son and tries to talk him out of being so serious. It doesn’t help that Ben’s father is a butcher and Ben decides to become a vegetarian! 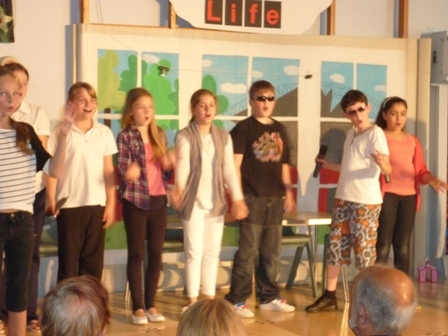 “Acting in the play was fun but it could be difficult as well. There were many lines to remember and you had to make sure you didn’t get the lines wrong,” said Adam. 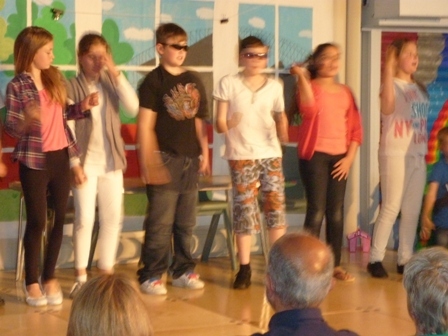 Here are some photos of the Y6 play in performance. 1) How long did it take to put the whole thing together? It took quite long but it was worth it. 2) What did you think of it and why? I thought it was really good. 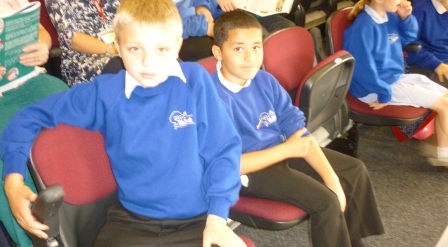 All the schools were great but particularly Holbrook. 3) How well did it go? 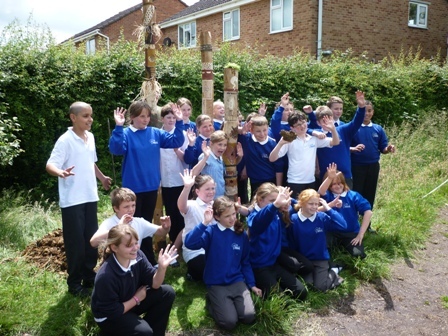 I thought it went very well because we worked very hard and we did extremely fantastic. 4) Did everyone enjoy it? Yes I thought everyone enjoyed it because we all thought it was a really fun thing to be a part of. 5) Were there many schools there? Not many schools were there, but some left a presentation because they couldn’t be there. 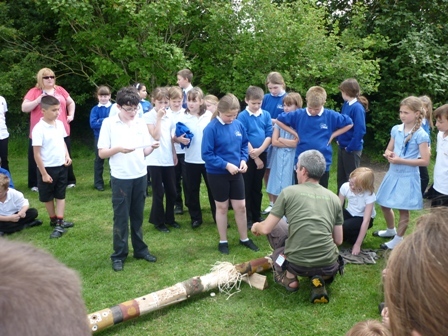 6) Do you think Mr Whitewick did a good job and why? Yes because he directed it, tweaked it, taught us the drama and made it a success! 7) Were people impressed by the peformance? Yes because everyone else had scripts but we didn’t. 8) Was there anything you could have changed to make it better and why? No because it was perfectly AMAZING! 9) Do you think everyone was loud? Everyone was very loud and clear and you could tell that people could tell what they were saying. 10) Were Holbrook the best and why? Yes because we are just awesome and we were well behaved! 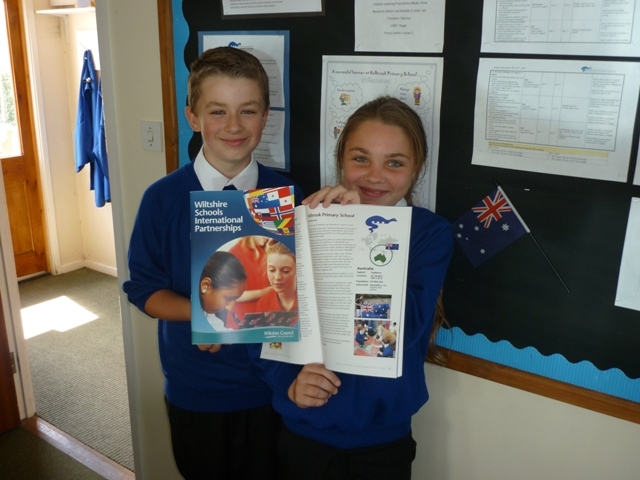 At the same conference at which our Y4 pupils presented their drama about Australia Year, we received copies of the new book all about Wiltshire schools’ links with partner schools around the world. Matthew and Sophie wrote the Holbrook contribution to this book. If you can’t go to Australia, get Australia to come to you! Over the current school year, Holbrook has been focusing on Australia. 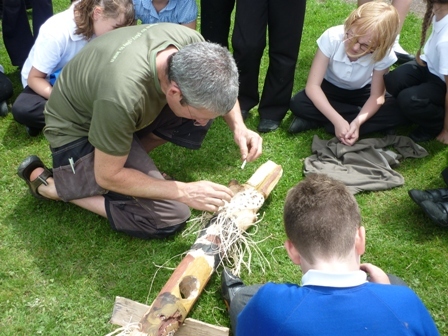 This is so that everyone connected to our school can share their knowledge and find out more; parents and governors as well as pupils. 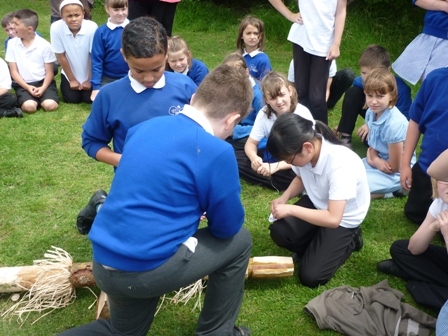 Throughout the year we have given our usual school events an Australian flavour, for instance on 11th November we remembered Australian soldiers, for our annual contribution to the dance festival we performed a dance based on Aboriginal Dreamtime stories, and our Year Four play was about Australia. We have had many visitors to school to help, some of them real Australians. The year started with a visit from Travis, a student from Adelaide. He taught us Aussie rules football. Mr Clarke, a Wiltshire Adviser, visited us several times. He told us Dreamtime stories, talked about Aboriginal Art and Australian animals. Chris Holland is a musician and artist. He taught us some basic didgeridoo skills. 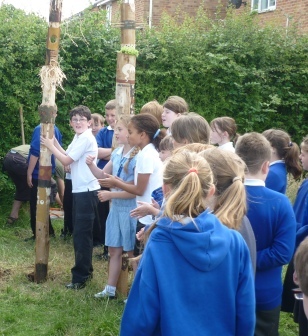 We started a blog (www.holbrookaustraliayear.wordpress.com) which a group of Y5 and Y6 pupils keep up to date with all the news of our special year. The best thing is that we found a school in Australia also called Holbrook School. We made contact and asked them to work with us. 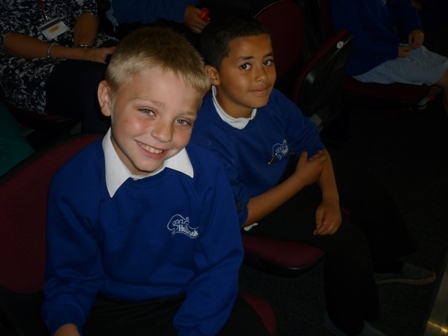 Their Principal and school leaders have shared ideas with our headteacher and School Council; we have exchanged work and they have answered our questions about their country. Australia Day (26th January) was a big day in our school. The blog group led an assembly and we worked together to create a giant map of Australia, now on display in our hall. We wrote a letter to the Australian High Commissioner to ask for some support and he wrote back and put us in touch with people who could help us. We got the whole school to read the same books: ‘Diary of a Wombat’ by Jackie French for KS1; and ‘Stories from the Billabong’ by James Vance Marshall and Francis Firebrace for KS2. Waterstone’s store in Trowbridge helped us with this project. Then, we had a brilliant visit from Francis Firebrace himself, an Aborigine from the Yorta Yorta people, who showed us his artwork. We all then had a huge art session and tried our hand at art, aboriginal style. After school pupils had their books signed. To sum it all up, we would say that learning about Australia is brilliant when you can learn from real Australians.